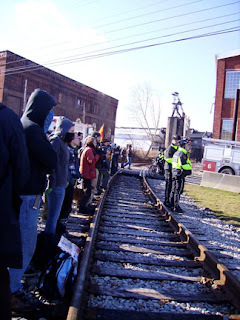 Pittsburgh, Pennsylvania, U.S. - Members of the Pittsburgh Organizing Group (POG) and their supporters successfully shut down the National Robotics Engineering Center (NREC), a largely Pentagon-funded venture of Carnegie Mellon University (CMU,) early Friday morning. 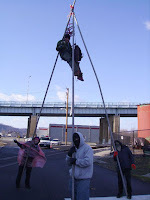 The anti-war demonstrators used a variety of human blockades including tripods and lock-boxes to prevent researchers and staff from entering the facility that has become a world leader in warfare robotics. Police only arrested 14 of the 34 demonstrators that locked themselves to to each other and fences surrounding the building. Around 12:30 pm, after seven hours in position protesters declared victory and lifted their blockades.